How often have you sat through a conference and walked away with so much information that you didn’t know where to start? Sounds like almost what happened to Guider Belinda after she attended the YWLGF seminar recently. Belinda, however, took all of her energy and came up with a SustainCAMPable project. Now sit back, read about it here and help her make it happen! In March, I had the honour of representing GGC at the Young Women Leading for a Greener Future (YWLGF) seminar at Sangam World Centre in India. The goal of this seminar was to empower young women to educate, speak out, act and motivate others to take action for a greener planet. We had 39 young women representing 34 countries at the event. During the seminar, there were a variety of sessions to develop our leadership skills, connect with others about environmental issues, discover the culture of India, learn about WAGGGS and member associations, and inspire us to be environmental change agents. I had the trip of a lifetime, met some amazing people, and left India super pumped, excited, and really felt like I could change the world. As part of the event, each participant created an action plan to implement in her member association. A few brainstorming and reflection sessions later, I came up with an idea: a sustainable camping challenge. Since camping is something that brings so many of us together, creates lifelong memories, and links so closely with the natural environment, why not use it as a platform for promoting positive environmental behaviour change? I planned to assemble a project team, develop a toolkit with activities, recruit Units to take the challenge, and then blog about their success stories. We closed the seminar around a Mandala. Everyone is wearing placards with motivational phrases that they created the night before, and we all contributed to finish filling the Mandala with colours to represent all our learnings at the seminar. I return to Vancouver and reality hits. Yes, those Area Commissioner duties that I have neglected for the past three weeks. How many emails do I need to reply to? What, another Area mini-crisis to tend to? Oh, and not to mention my real job. Though, sometimes I feel like Guiding is my real job and my day job is just something on the side. The work/volunteering/life backlog starts to grow. Fast forward to the end of April. One month had passed. I’m way behind schedule on my way- too-ambitious action plan. I haven’t submitted my final report yet to Girl Guides of Canada (done now, about two weeks late). I haven’t even talked to my own Unit yet about my trip (finally did it last week). The hardest part of these self-led passion projects is to stay motivated and keep yourself accountable to keeping your commitments. Sometimes you just need a bit of a push. My push came in the form of catching up with a fellow YWLGF participant, Sophie, who went to the session at Our Chalet. She was moving ahead with her project, so I figured I better work on mine. Having let this project sit for about a month, I had time to reflect and get feedback from various Guiding Members and girls in my Unit. I decided that my approach should be more innovative. People need ownership over their actions, and feel like the choices they make are theirs, not just something prescribed in an activity toolkit. By creating their own goals and actions, they may be more likely to follow through and continue those positive changes. Instead of a challenge in the traditional Guiding sense (do activities, get a badge), I shifted to more of a “create your own” type of project which really aligns more with the girl-led aspect of Guiding, and is much more adaptable to the variety of conditions in our vast country. SustainaCAMPable – Striving for environmental sustainability, one camp at a time. Now for one more twist to end this post, I thought to myself last week: Wouldn’t it be cool if this was a living project that develops and changes over time, building on lessons learned each step of the way, camp by camp? Rather than go through the traditional project development method of create, test, tweak, and then launch to the masses, I’ll just put everything out there and let everyone contribute as I go. Who knows what could happen! That’s what keeps it exciting. In any case, the first step is done. The SustainaCAMPable blog is now up and I’ll be writing more posts about my progress, starting with my Pathfinder Unit’s camp on the Victoria Day long weekend at Camp Olave. Come check it out! By guest blogger Belinda. Belinda is the Area Commissioner of West Coast Area and a Guider of the 6th Vancouver Pathfinder Unit. 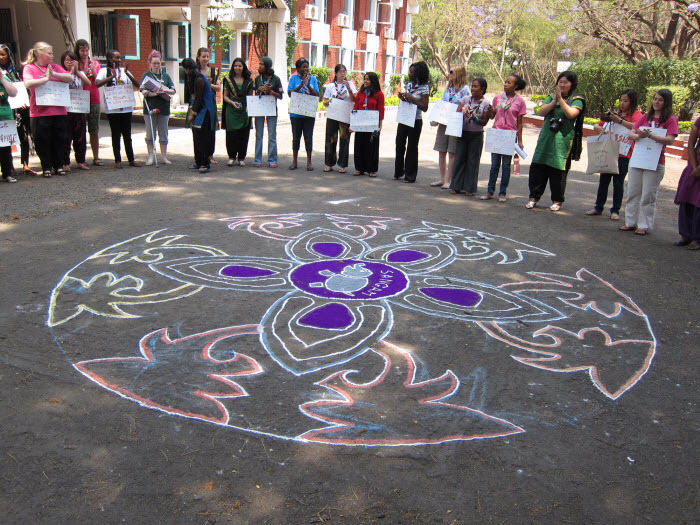 She represented Girl Guides of Canada at the Young Women Leading for a Greener Future seminar at Sangam in March. Outside of Guiding, she is an environmental engineer specializing in solid waste planning. Only 1 more week to cast your vote! During the month of May 2012, all GirlGuidesCANblog email subscribers can vote for their favourite posts from our list of the 25 most-read guest blogs! 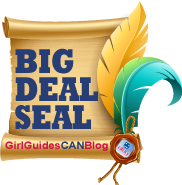 Be part of the GirlGuidesCANblog Big Deal Seal! This entry was posted in Girls' Guides and tagged eco citizens, female role models. Bookmark the permalink.